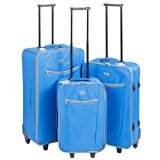 This set of quality cases from Penn will have you traveling in style with three fantastic sized bags. The suitcases have a rugged construction and have many luxury extra features such as chunky zips, front pockets, interior pockets and cloth retainer straps for organised packing travel. Traveling with these lightweight cases is easy thanks to their smooth rolling rubber wheels, retractable handles with an extra option of two carry handles.